Summary: Most people focus on the month-to-month changes in the jobs report, which consists mostly of noise. The 12-month changes are more revealing. We remain in a slow recovery, somewhat faster than in 2010. We should enjoy it, as it was bought at great cost. A cost we cannot long continue to pay. Here we examine the March employment report from the Bureau of Labor Statistics. They conduct two surveys: one of households, one of businesses. They are not directly comparable, each giving different perspectives on the US economy. Today we look at the year-over-year changes in data in order the avoid seasonal adjustments distorted by the warm winter. The picture painted is consistent with the many other streams of information about the economy — effective rebuttal to the cultists who insist all the government data is faked to re-elect Obama or benefit the Trilateral Commission. The important detail to know about the recovery: during this period the government’s public debt increased $1.3 trillions – aprox 8.4% of GDP (source here), one of the higher fiscal deficits in the world. Our shiny recovery results from massive borrowing and spending, without which we’d be in a deep recession, like Italy or even Spain. In other words, organic growth has not yet resumed. The US economy has stabilized and slowly improves due to the massive “drugs” of monetary and fiscal stimulus. Both have severe side-effects, which at some unknown point in the future will become problematic or untenable. But the worst side effect was unexpected: the stimulus has eliminated the pressure for reform. We have had the New Deal stimulus without the New Deal reforms (some of which failed, but some setup the great post-war boom). The survey of households shows slow improvement, with the number employed growing at the same rate as the civilian non-institutionalized population. But the number not in the labor force grew even faster. The second survey asks employers to report jobs. It shows a similar pattern of growth as the household survey, giving us confidence in the result. Slow improvement. The analysts at BLS calculate six measures of unemployment, from narrow to broad definitions. None is more real than the others; none are easily comparable to the rough estimates of unemployment during the 1930s (the first reliable surveys were in the early 1940s). Most people consider U-3, or U-4, or U-5 as the most useful measure. 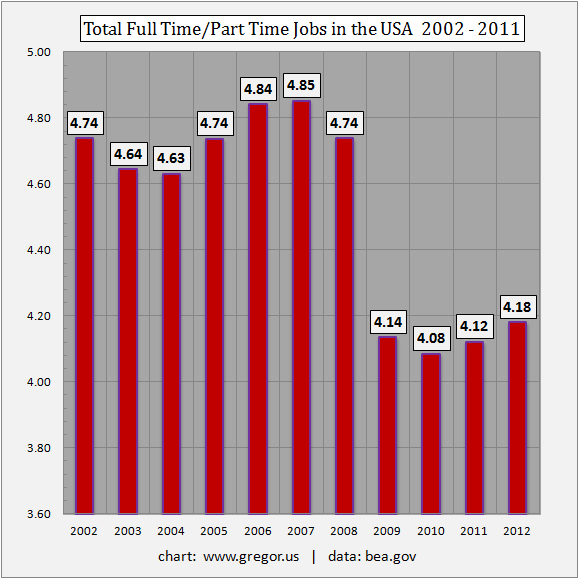 U-6 includes people with part-time jobs who prefer full-time work, and so includes underemployment. Any way you count it, unemployment has decreased during the past year. Slowly. Under the stress of the recession many employers took another step from the standard post-WWII model to the new one of contract labor: temporary help, independent contractors, and (as shown to the right) part-time labor. workers are difficult to unionize. The graph is from the website of Gregor Macdonald. This post originally appeared at Fabius Maximus and is posted with permission. 2 Responses to "About the March Jobs Report – a Few Jobs Bought at Great Cost"
I am constantly amazed at the Economonitors decent news but clear bias in words evaluating the economy. For example, this author's use of the phrase "cultists who insist all the government data is faked to re-elect Obama " tries to shut down legitimate debate. Additionnally future comments by the author indicate he actually recognizes that the stimulus was at some leel ineffective in developing organic growth. Unfortunatly there is never clear analysis of the effects of the recent Democrat controlled Congress and Presidents POLICIES that are inhibiting the growth possible. It would be better if there could be balanced analysis instead of constant bickering and subtle bias. "Both have severe side-effects, which at some unknown point in the future will become problematic or untenable." How's that? The point is likely to be never. Go back and read your economics textbook on internal government debt.